In the logistics world, one-day delivery is increasingly becoming an expectation. However, there have been many questions raised over whether this is currently achievable, as well as recent indications that major retailers are not delivering on promises made where one-day delivery is concerned. So, what does the future hold for this super efficient type of delivery? A recent issue between major retailer Amazon and the ASA has thrown the spotlight onto one-day delivery services. The ASA recently banned an advert produced by Amazon that was advertising one-day delivery for Prime members. The advert was banned by the ASA for being misleading because most of the 280 people who complained about it had not received their items within the promised time limit. The complaints and the subsequent action by the ASA have shown just how difficult it is for retailers to meet these types of promises. There are three key issues that most face. The reality is that no matter how hard retailers try to keep promises such as one-day delivery, sometimes they are simply not met. The wrong choice of external courier may let the business down, traffic may cause issues, vans break down and even the weather can interfere in preventing retailers from sticking to the one-day delivery promises that have been made. 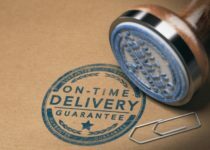 This is clearly a major issue, as customers often pay more for super fast delivery and if that is not provided then retailers may find themselves in the costly position of having to issue refunds as well as incentives to return to the business again, despite the negative delivery experience. It’s all very well making a one-day delivery promise – and many retailers honestly intend to keep to that promise. However, issues of logistics and scale can derail even the most well meaning intentions. Depending on the size and structure of the retailer, it may not be physically possible to dispatch certain products to a customer so that they arrive within the one day window. Even Amazon, which has one of the most impressive logistics infrastructures in retail, struggled to do this with stock held in overseas warehouses, for example, simply not arriving in time. Many customers have found Amazon’s one-day delivery promise confusing in terms of which products it covers and which require a longer shipping window. In Amazon’s case, it simply can’t provide the guarantee of one-day delivery where products are being provided by third parties, for example. And yet it’s often not clear enough for consumers – according to the ASA – where a third party is involved. Retailers relying on multiple parties for supply and shipping could also face a similar issue with different shipping times applicable to different products. There are clearly some problems surrounding one-day delivery promises that need to be worked out before this service can be flawlessly delivered every time. A UCS we offer a range of reliable and cost effective delivery solutions – contact us to find out more.